Add Living Space to Your Home: Converting Two Story Rooms - Armchair Builder :: Blog :: Build, renovate, & repair your own home. Save money as an owner builder.- Armchair Builder :: Blog :: Build, renovate, & repair your own home. Save money as an owner builder. 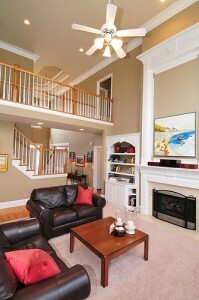 The new homes built in the 90’s brought us two story rooms that created a dramatic, grand feel. 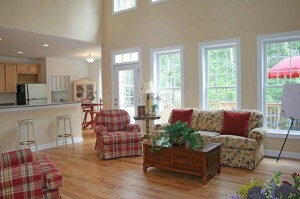 These two story rooms are still built today because they give the feeling of openness while making spaces feel bigger. Although interesting architecturally, these rooms can be difficult to heat and waste space that could otherwise provide additional storage or living area. I was asked recently how difficult it would be to add a bedroom over a two story family room in a townhome. Here we will discuss the main items to consider as an owner-builder for this type of project. We will also give you the estimated costs so you will have an idea what to expect before you bid the project out. Adding Egress: In our particular case, there is a loft adjacent to the two story area. There is also an existing half wall in the loft that you can look over to see down into the family room. This would allow us to easily add a door to the new space from the loft. The open area above the family room has windows on two sides, but since they are up high, they have fixed glass (meaning, they do not open). Per code we need to provide an escape window in the bedroom in case of fire so at least one of the windows would need to be changed out to an operable sash. This could be done rather easily by removing the glass and installing a remodel window into the existing frame. You would also want to check to see how high the windows will be off the floor after the floor framing is complete. Depending on how much space there is from the floor to the bottom of the window, you may need to add tempered glass to the windows. Typically the code requires tempered glass on any window that is 18″ or less off the floor. Heating: In our particular example home, all of the ductwork for the second floor was installed in the attic through insulated ducts. Although not the best practice, having all of the ductwork in the attic would allow us to easily add conditioned air to the new space. The furnace is also located on the second floor only fifteen feet from the new proposed space. We would need to add two heat runs and a cold air return to properly condition the new 200 square foot room. This would be relatively easy and inexpensive to accomplish because of the location of the furnace and ductwork. Electrical: Because the new space is close to the garage that has the main electrical panel, we could run a new circuit for the electric from the main panel rather easily. This would allow us to install the required AFCI (arc fault circuit interupter) on the circuit to the bedroom as required by code. The AFCI is a circuit breaker designed to prevent fires by detecting a non-working electrical arc and disconnecting the power. Arcing faults are one of the major causes of fires. Nearby combustibles can ignite when high temperatures are generated from unwanted arcing. Drywall damage can be minimized by running the electrical through the attic from the garage. Supporting the Floor: We will want to consult our architect to make sure we get the configuration correct on this. Not only is this is a good building practice, but your new design will also be given to the building department for permit review. Having a design professional review the loading will ensure the project gets approved. Our new space has two exterior walls and two interior walls. Below the new proposed space, there is a wall under one of the new interior walls. This wall currently supports the existing loft floor. Therefore, we could use this same wall to support the new floor. So, our architect would need to size the floor framing to span the distance from this wall out to the outside wall. With this setup, we should be able to add the floor framing without having to add any beams. Your architect can also review the footer sizes underneath the new load bearing walls. In order to save money, you should have your existing home plans available to give to your architect to review…this will save time and money. If you don’t have a copy of the plan, check with your local building department. Many times, they keep plans on file from permit submissions. Estimated Costs: For this example, our new proposed space would cost between $4000 and $5000. These costs will vary based on the types of materials you use, your existing home design, and the labor market in your area. Adding living space above a two story area is typically less expensive than putting a new addition onto your home because we are using the existing roof and foundation. Cost Breakdown…assuming you take on the role of the general contractor, demolition crew, and cleaning company. For this particular project, you will save several thousand dollars by taking on the role of the general contractor/owner-builder/armchair builder. Have you ever thought about building your own home? Be sure to stop by the Armchair Builder How to Build Your Own Home resource page. << Build My New Home in 90 Days?